Curtain Rings and Drapery Rings of all types from small to large including curtain rings with clips and curtain rings with eyelets made from metal, bamboo to wood and resin to acrylic. These curtain rings are the perfect choice for a decorative look for shower rods to valances, curtains, drapery and other window covering treatments. These curtain rings offer styles for modern to traditional tastes in unfinished wood curtain rings to finished curtain rings in a wide range of colors that offer a variety of attachment methods to help make hanging your window coverings a breeze. The great variety designs offer sizes ranging from the small curtain ring for rods 1/4" in diameter to large curtain rings for poles as large as 3" and everything in between including the popular 1", 1 1/2", 2" and 2 1/2" sized curtain rings. Black drapery and curtain rings in all sizes and styles are offered for helping you achieve all sorts of great looking window treatments. These black curtain rings have small 1" to big 3" drapery rings and all sizes in between, in a variety of materials that range from metal to wood. These black curtain rings come in a variety of ways including; rings with clips and eyelets, with some of these curtain rings having removable clips to S style rings. 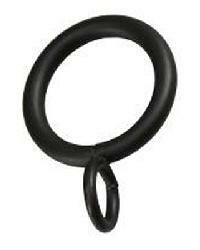 That's not all as these black curtain rings also offer square and oval shaped drapery rings as well. This offering of curtain rings with clips features curtain rings with clips for creating a fabulous custom curtain or drapery for your homes decor. These curtain clip rings are offered in a variety of styles, sizes and colors to help complete your curtains, drapery and other window treatments. Because of their nature, most of these curtain rings with clips make it easy to swivel your panels this way or that when traversing. Because of their flexible nature they are also the perfect choice when trying to train certain window treatments into the desired shape. Curtain Rings with eyelets are attached to your curtains, drapes and window treatments using thread or drapery pins. 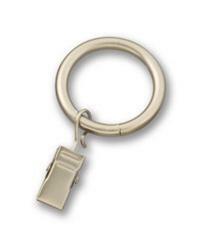 An ideal way to sew on eyelet curtain rings is to use dental floss which creates a secure hold. These drapery and curtain eyelet rings are available in plastic, metal and wood, including unfinished wood and in sizes from small to large. The colors and shapes of these curtain rings with eyelets have something for everyones decorating needs. Create that designer look with this offering of decorative curtain rings and drapery rings that are perfect for finishing off that custom window treatment. These stylish curtain rings are available in metal, wood and leather, with decorative looks from bamboo, carved wood, twisted metal, square and even with embellished leaves and scrolls. These decorative curtain rings range from modern to traditional themes in a wide range of color choices that will be the perfect finishing touch to your drapery or curtains. 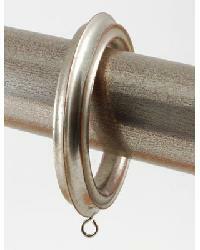 Shop Large drapery rings and large curtain rings that fit rods over 2 inches in diameter up to 3" in diameter. 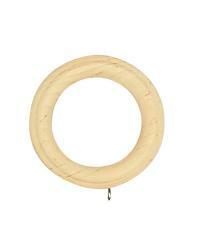 These large curtain rings feature eyelets and are available in wood, resin and metal in a variety of colors and styles. The large metal curtain rings are offered in a smooth finish as well as a twisted look. Bamboo curtain rings for that tropical look as well traditional curtain rings and modern styled curtain rings are offered. 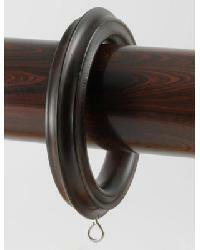 The wood curtain rings offer both unfinshed rings as well as rings in a variety of painted finishes and stain choices. 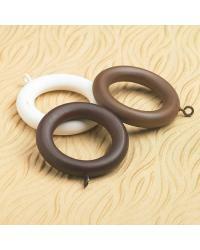 The resin curtain rings offer elaborate designs created from their carved molds. Large window treatments call for large scale, and the large diameter curtain rods to fill that need require the large curtain rings that are offered here - so shop away! Beautiful metal curtain rings for your draperies, curtains and other window treatment needs. A wide variety of colors including brass, silver, nickel and iron colored metal curtain rings are offered in a large variety of styles, shapes and sizes. 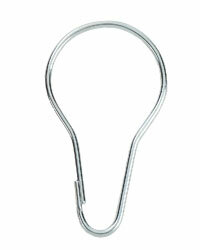 These metal curtain rings come plain, with eyelets and also with clips. Thats not all, as these metal curtain rings come twisted, braided, embellished, round, square D shaped, and C shaped. From modern and contemporary to traditional this selection of metal curtain rings will complete your homes decor. Modern curtains and drapes require a certain sophisticated style. These modern curtain rings have that style with their unique mix of offerings, that include square curtain rings, clear acrylic rings and many other modern curtain ring styles in fun and funky shapes. 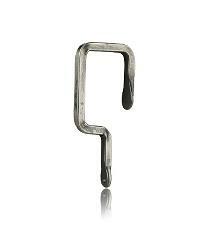 Shower curtain hooks and rings from the basic pear shape to decorative shower curtain hooks in unique styles and designs for completing your bathrooms shower curtain look. Curtain rings in silver and nickel colors in a variety of shapes and sizes for modern looking window coverings. This nickel and silver curtain ring offering has a streamlined sheek modern look for decorating todays modern homes decor. 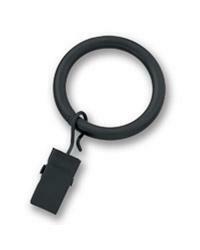 All types of small curtain rings to fit small diameter curtain rods. 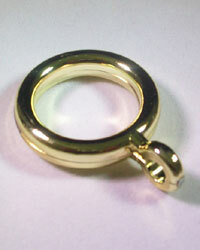 The small curtain rings featured here are meant to fit curtain rods 2 inches in diameter or less. Traditional styled drapery and curtain rings in classic wood, to resin and metal to complete that traditional look for your homes decor. A huge variety of sizes for every sized curtain rod is offered and include curtain rings with eyelets, clips or are just plain. Colors galore abound within the wide range of types of curtain rings are offered for helping complete just that special look to your window treatments. 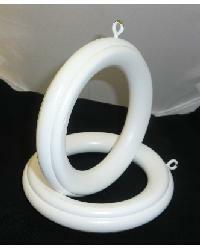 These unfinished wood curtain rings are ready for you to paint or stain so you can customize to match your homes decor. A variety of sizes to fit curtain rods from 1 3/8", to 1 3/4" as well as 2" and 2 1/4" are available. But lets not stop there, because there are large rings for 2 3/4" and 3" rods as well. These unfinished wooden curtain rings come in plain and reeded styles with eyelets to make hanging your window treatments a breeze. 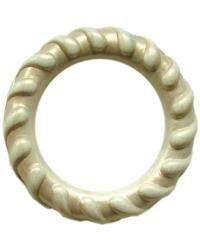 All types of white curtain rings and white drapery rings are available in shades of white. These white curtain rings and drapery rings are offered in both wood as well as metal and acrylic in a variety of sizes that fit curtain rods from small to large. Wood curtain rings and wood drapery rings with eyelets in all sizes. In this wood curtain ring and wood drapery ring section you will find wood pole rings for small curtain rods all the way up to 2" and 3" wood curtain rings. 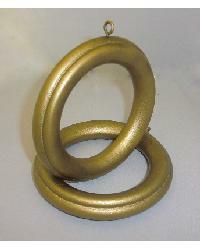 InteriorDecorating.com offers drapery and wood curtain rings in every other size imaginable. 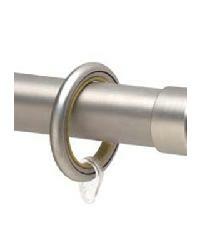 Magnetic curtain clips are a great way to replace curtain rings. Just clip onto your curtains. 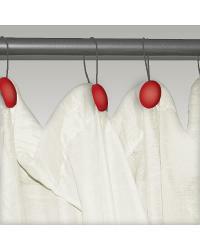 These magnetic curtain clips can hold tight through any curtain material without marking or damaging the fabric. Therefore, you do not need to drill or use any extra hardware to install your curtain rings or tie backs.